Horsham manager Dominic Di Paola said adding striker Kieran Lavery on loan ahead of a busy festive fixture list in December was a ‘no brainer’. 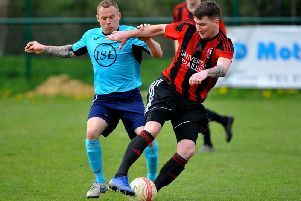 The former South Park forward has joined on a month long loan from Premier Division outfit Dorking Wanderers to rebuild his fitness having missed six weeks through injury. He will help the Hornets, who now occupy the Bostik League South East play-off places, in a tough run of fixtures which sees them play Hythe Town on Saturday and Three Bridges on Tuesday night. And despite his red card against Eastbourne Borough in a narrow 1-0 injury-time defeat in the Sussex Senior Cup on Tuesday night, Lavery will not receive a league ban, with the Hornets also playing leaders Cray Wanderers and Haywards Heath before Christmas. Lavery will join up with his former strike partner Chris Smith with the pair having played for many seasons together at Reigate-based South Park. And Di Paola is pleased to have bolstered his attacking options, explaining: “Smudge (Smith) has been away and I thought we looked a little bit light up front during that time against Greenwich Borough and Bath. “With the month we have coming up with some really hard games we will have to use everyone in the squad. Dean Lovegrove is away in December as well and James McElligott has gone out on loan for a couple of games at Horley Town. “I thought bringing someone in gives the chance for others to go out a get some games and not leave us short. “It’s a no-brainer. Kieran is another good player for our level and in the run up to Christmas with Saturday and Tuesday every week, it just makes sense to go for them when a player of that quality becomes available. On Saturday’s clash at third-placed Hythe, Di Paola added: “It’s a very, very tough fixture. Away from home, they are good at home, with good support and they get at you.